BOXX Technologies has launched two APEXX workstations targeted at animation, rendering, simulation and 3D modeling users. Equipped with eight cores on two overclocked Intel Core i7 processors, the workstations are capable of exceeding 4GHz clock speeds. 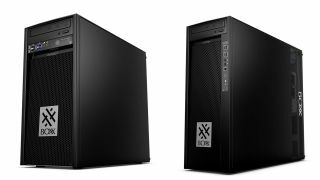 BOXX claims the APEXX 2 3402 and APEXX 4 7402 workstations are optimized for single- and multi-threaded tasks, and the 33GHz aggregate frequency will lead to faster rendering and simulation. "For users whose workflows require both high frequency and multiple cores, the dilemma has always been that with an increase in cores, a decrease in frequency follows," Shoaib Mohammad, BOXX VP of Marketing and Business Development, said in a statement. Even though Intel's Core i7 processors ship with clock speeds up to 3GHz, BOXX claims that its workstations can safely maintain the 4.15GHz overclocked speeds "throughout the life of their warranty." BOXX says that its benchmarking reveals that the eight-core systems outperform more expensive 10-core Xeon-based machines thanks to the overclocking advantage. An example of a 10-core Xeon workstation is the Dell Precision T7810, a system with configurations priced between $1,529 (£1,000, AU$1,910) and $7,130 (£4,655, AU$8,905). "The result is vastly improved viewport performance (panning, zooming, and manipulating 3D objects), significantly faster opening/closing of assemblies, and quicker rebuilds - single-threaded tasks bound by the frequency of the processor, not the number of cores or GPUs," BOXX said of the performance of the APEXX workstations. The APEXX 2 can be configured with two graphics cards and 32GB memory. The APEXX 4 can accommodate up to four graphics cards and 64GB memory. Both systems feature liquid cooling and support for solid state drives. The overclocked eight-core APEXX 2 starts at $4,611 (£3,010, AU$5,758), but users who don't need the overclocking can get cheaper configurations with four cores of processing power starting at $2,086 (£1,362, AU$2,605). In our review of the 4.0GHz Intel Core i7-equipped APEXX 2 with Nvidia Quadro K5200 GPU, we found the performance to be extremely fast, with a Wi-Fi adapter being the only thing lacking on the system. The more powerful APEXX 4 starts at $5,193 (£3,390, AU$6,485).